I normally refrain from posting non-weather/political commentary on this blog, but recent events have forced me to crunch some numbers. 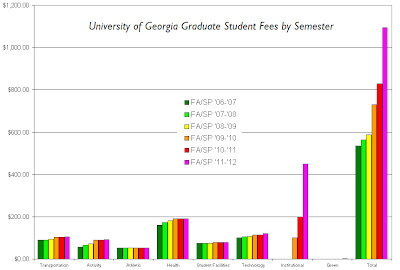 Numbers specifically related to student fee payments at the University of Georgia. A majority of this increase has come in the form of an "Institutional Fee" (Figure 1). In fact, the 2012 annual cost of the institutional fee alone is now roughly equal total annual student fees charged in 2007. Somewhere buried in UGA website, I was able to muster that the "Institutional Fee" was implemented in FY 2010 to "*help maintain the academic quality that you demand*". Ha! To me, this is also known as, "We are trying to not make cuts to positions across campus." 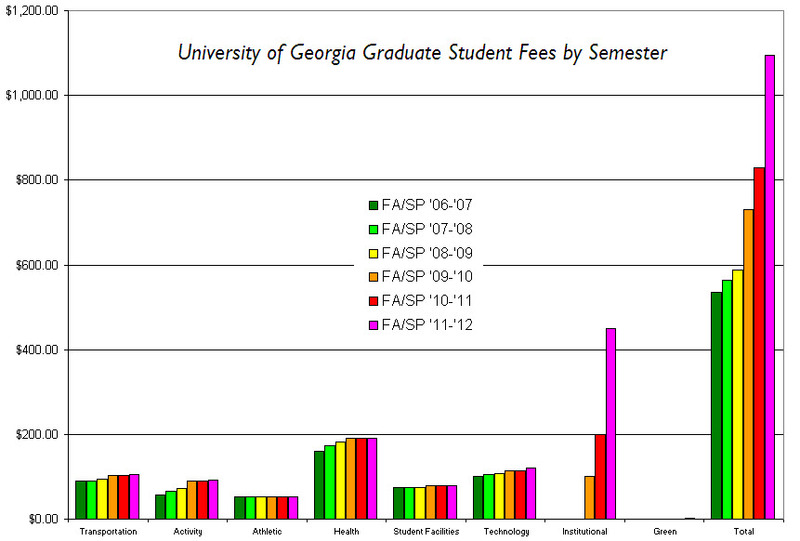 Looking at the annual total, one can easily see the increasing burden being put on graduate students at UGA (Figure 2). 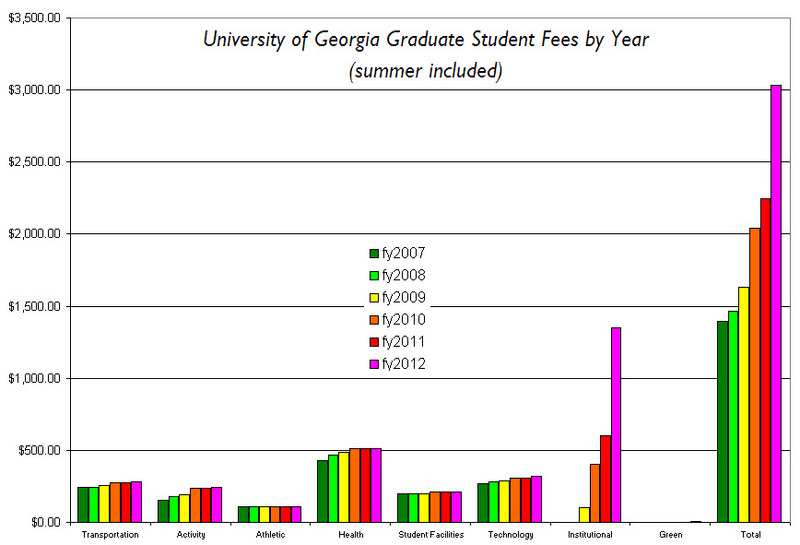 The average UGA graduate student now pays roughly $3,034 in annual student fees, up from $1,395 just five years ago. This equates to a 117.5% increase in just five years! IMO, this all stems from a much bigger problem in 'Merica today. It is quite easy to see the disinvestment in higher education at the state (and I would argue Federal too!) level. State cuts school budget; school doesn't want to raise tuition to look "affordable"; student fees are raised to account for this lack of investment. This puts all of the burden on the student! When will it end? I cannot say for sure, but it does appear to me to be eerily similar to the collapse of the housing market. Skyrocketing costs of education and the pressure of attending college are forcing students to enter into loans that have absurd interest rates after graduation. If they cannot find a job (not the easiest thing to do in this current economic climate! ), they will likely end up defaulting on their loan. Sound familiar? Well-said, Victor. And to top it all off: President Adams approved these increases (because "in these tough economic times, everyone has to do their part") while giving himself a pay raise! Classic move. As Bachmann-Turner Overdrive (now Bachmann and Turner) once said: "You ain't seen nothin' yet". This is going on everywhere. NIU's alone went up some 10%+ in the fall semester.